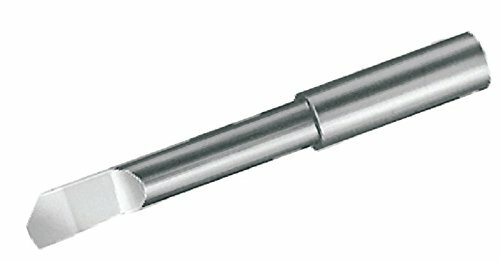 The MICRO 100 HBB-3001500 uncoated solid carbide, helical back rake boring tool. Designed and engineered with the neck of the tool centered to the tool's shank and is excellent for boring applications especially in jig bore machines. The helical grind of the tool provides ideal top rake for better chip control and evacuation when utilized in most type of machines requiring boring/turning applications. Manufactured with close tolerances to ensure ultimate precision and performance. Each tool's cutting edge/tip has a distinctive mirror like finish that significantly adds to material removal while improving surface finishes. MICRO 100 Solid Carbide Tools feature more than just a micro-grain of excellent quality. Their substrate is in a class of its own resulting from exclusive treating processes that allow for vastly increased speed and feed rates. For over 45 years, MICRO 100 is a known industry leader and internationally acclaimed when it comes to solid carbide tooling.